Basic house wiring starts with your main service panel. This is where the main power comes into the house from the street. It is also the place where breakers need to be reset when they trip and the power goes off. Not sure if this is your problem? See the articles 'Basic Residential Wiring' and 'Home Electrical Repair' for a listing of all the electrical topics. Sometimes call a 'load center' or 'distribution panel', this is the nerve center of the homes electrical system. At the top you will usually find a main breaker. I say breaker, but some houses still have fuse boxes. Fuse boxes are becoming less and less common. A main breaker may be anywhere from 50 amps to 200 amps for an all electric home. Most new homes have between 100 and 200 amp services installed. The main breaker shuts off the power to the two bars that run down the center of the panel. These are the hot lugs of the panel. In one way or another, all the basic house wiring in your home involves these three wires. Located along the sides you will find a ground bar and a neutral bar. The neutral bar is connected to the main neutral wire coming into your home. You will normally hook white and sometimes bare ground wires into this bar. The ground bar as the name implies is hooked to grounding wire that is attached to a ground rod or sometimes a copper plumbing pipe. Note: Attaching a ground wire to a plumbing pipe does not meet code in most places. Black, red and sometimes white wires are hooked to the individual breakers, depending on the type of circuit. The breaker interrupts the hot wire, similar to what a light switch does. Some breakers are two pole, providing 240 volt current for heavy duty appliances. Every other breaker, as you move vertically down one side is hooked the same hot side. Thus a two pole breaker picks up power from both sides of the panel. Installing a new panel is a pretty big job and will usually be left up to the professionals. Not impossible for a homeowner, but it you will need to read more than one article about basic house wiring before you tackle it. Unless of course, you cousin is an electrician, then you are good to go. Adding a circuit may be something you would consider tackling. Do not work in the panel without shutting off the main breaker. Even then you still have power in the top of it. Don't have a main breaker? Then you will probably have a disconnect below the meter. Essentially the same as main breaker, just in a different location. See the article 'Electrical Safety at Home' for tips on what to do to prevent shocks and injuries when working with electricity. Without a doubt this is the main reason you will be interested in the main panel. 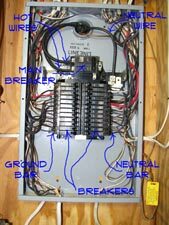 Whenever you lose power to an area of the house, the 'breaker panel' is the first place that you go. A tripped breaker is easily identified. It will be at about the mid point between fully on and off. You have to switch the breaker to off and then turn it back to the on position. Circuit breakers can go bad. If one keeps tripping when there is no extra load on it and no short, then it is likely not working properly. You need to get the correct breaker for a replacement. See the article 'Replacing Circuit Breakers' for instructions on how to replace one. Adding a circuit breaker usually means adding a circuit. A new circuit mean more electrical devices and the associated wiring. This is a bigger job that may be prohibitive for more than one reason. First would be the wiring. Would you have access to run the wiring. This might not be a problem in an attic, basement or garage. But in areas that are already finished it can be a big problem. If you are able to run the new wiring, you may be able to add a new circuit. See the article 'Adding New Circuit Breakers' for more information and instructions on what to do.